Can I Reschedule My Northern Lights Tour? The Aurora Borealis (also known as the northern lights) is a fascinating phenomenon caused by interactions between solar winds from the sun and our planet's magnetic field. The science may sound quite cold and robotic but the end result is anything but! 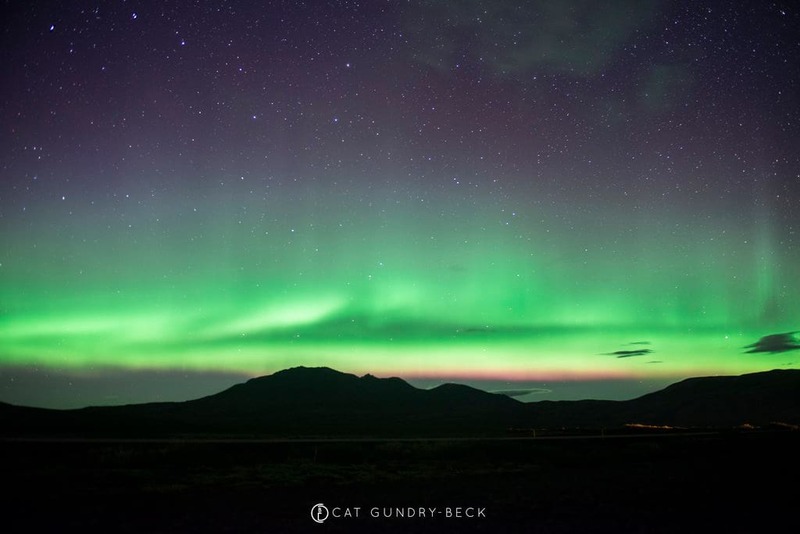 If you manage to get lucky enough to catch a glimpse of the Aurora you will be treated to a stunning display as fluttering bands of light and colour streak across the night sky. 1. My tour was cancelled due to bad weather. This is perhaps the most common situation that guests visiting Iceland will find themselves. 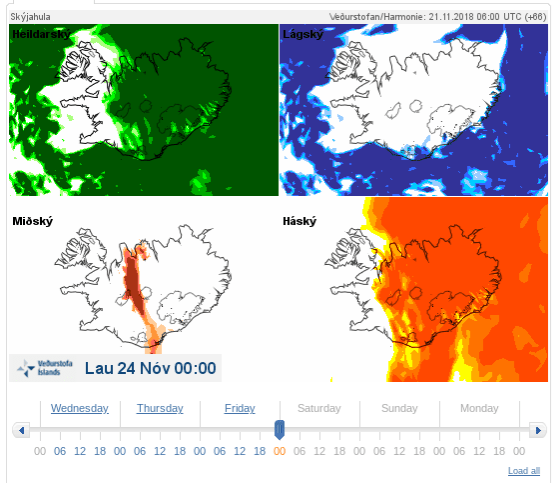 The weather in Iceland is a highly unpredictable thing and there will be nights where the weather does not look like it will be good for northern lights viewings. But how do we make that decision? Above you can see an example of one of the many weather maps we may use when making a decision about the northern lights tour. This particular map focuses on the cloud coverage over the country broken up into the high clouds, medium clouds and low clouds. Typically we focus on the top left square which is a composite view of the overall cloud cover where the green areas show clouds and the white show clear sky. 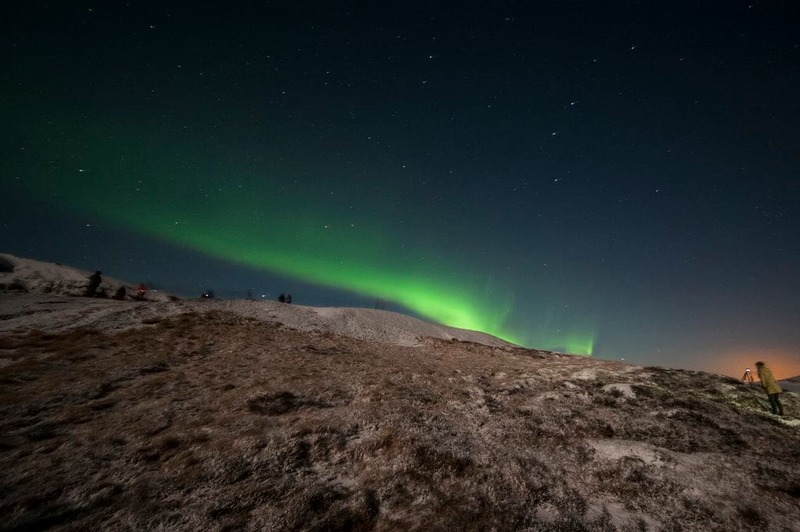 We are looking for significant openings in the cloud in the area around Reykjavik during the time where the tour will be running as you cannot see the northern lights if there are clouds covering them! We have an expert team who will use this data alongside other similar weather sites to make a determination as to whether or not the lights are likely to be seen and that is then how we make our determination. Based on this we will either declare the lights to be running or not that evening and will contact our guests for that night as to our decision. We always aim to decide around 4 PM and the banner at the top of our homepage will display the current decision. In the unfortunate event that we decide not to run the tour that evening, you will be offered a chance to reschedule your tour free of charge to another evening, based upon our availability. We offer this reschedule service for any date within three years of your initial travel date so even if you are not lucky enough to see the lights this time, you can always come back and try again. Rescheduling can be done either by contacting our customer support team or by using the link that will be provided in our cancellation email to reschedule yourself. Making sure our team has an accurate record of your email address is paramount here as we do not make phone calls to inform our guests of cancellations and rescheduling occurs on a strict “First come, First served” basis. If you have not been on any tour with us and are unable to reschedule you may also be offered an ability to refund your ticket. 2. I went out for a tour… But I did not see the lights? Despite our best efforts and best intentions, there will always be evenings where the lights simply fail to make an appearance. This can be very frustrating but you do not need to fret as we have policies in place to maximise your potential to see the lights. The final decision on whether the lights were seen or not on the night of your tour will ultimately rest in the hands of your guide that evening, they will let you know on the way back to the city if they believed the lights were not seen and will encourage you to get in touch with customer support to reschedule. As mentioned above you can use our reschedule service for any date within three years of your initial trave date and rescheduling occurs on a strict “First come, First served” basis. The big difference here is the fact that you will not be eligible a refund if you go out on a tour with us even if the lights were not seen as per our terms and conditions for this tour. We also reserve the right to re-upgrade you to your original tour where appropriate however you will always be contacted by our support team before changes like this are made either via a phone call or via email. For additional reading, we recommend all of our passengers to read both our FAQ’s page which has a section dedicated to the Northern Lights as well as our terms and conditions page which has additional details on our refund policy. Join us for the ultimate northern lights experience. This version of the northern lights tour is operated in partnership with Servio and as a result we are able to offer you an unparalleled experience in terms of comfort and service.